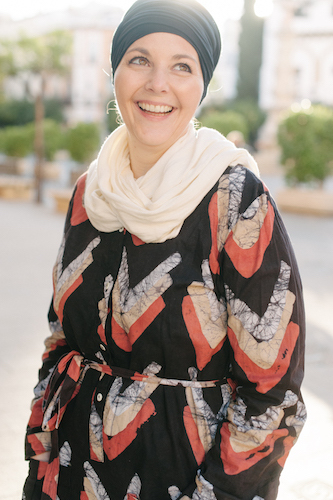 Today’s post comes from Tarana Khan an expat mom living in the UAE. She blogs at Sand In My Toes, where you can drop by to read more of her parenting and other adventures! You can also catch up with her on Twitter, Facebook, Pinterest or Instagram. Tarana grew up in the Emirates and has plenty of Ramadan memories. 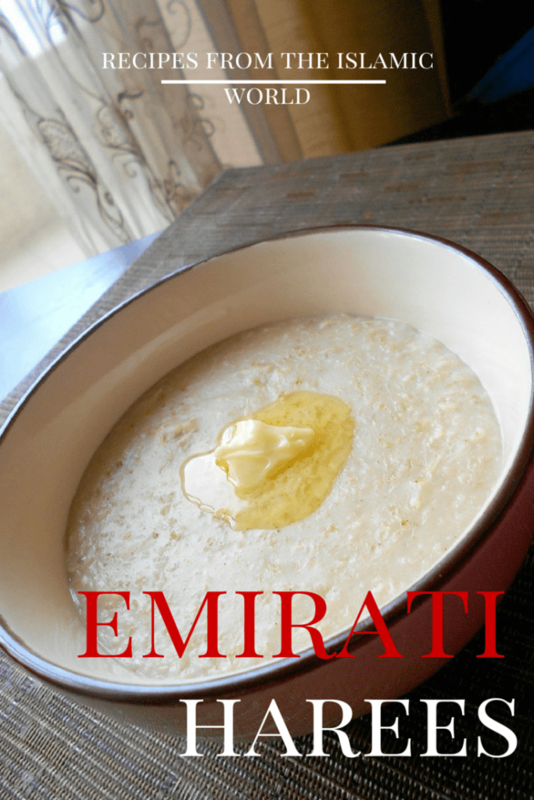 One of the things I noticed when I was visiting Dubai this May was the lack of traditional Emirati cuisine. Fear not, Tarana to the rescue! I grew up in the United Arab Emirates, and have spent many seasons of Ramadan here. At home, my mom always made traditional Iftar dishes from back home in India, such as pakoras, chaat, and samosas. We didn’t know any of the local families personally, but every Ramadan, almost every local household sent out Iftar dishes to their neighbours. Mostly, the dish was harees, a meat porridge made with cracked wheat. I can imagine it was made in large quantities as it was sent in generous amounts to each family. This was really in spirit with Ramadan, the month of giving and charity. The country has changed so much since then, and now we have lavish Iftars in restaurants with dishes from around the world. But the spirit of giving remains the same, and much food is distributed at mosques and to those who are away from their families. While harees is a staple local Iftar dish, other popular ones enjoyed here during Ramadan are thareed (made with thin bread, meat, and vegetables), machboos (fragrant rice with meat or seafood), and lgeimat (saffron-flavoured fritters in syrup). I’m happy to be sharing an easy recipe to make harees here with you. The original wheat recipe can take a long time to cook, but this easy oats version tastes very similar and is ready in less than 30 minutes. Harees is a very simple and hearty dish that is just perfect for breaking the fast. You can also make it with lamb but that does take longer to cook, and will make the dish darker. Boil the chicken with the cinnamon stick, bay leaf, the onion, and a pinch of salt until well cooked. Remove the chicken and cut it finely. Strain the remaining stock and bring to a boil. Add the oats and the chicken pieces and stir constantly with a whisk. 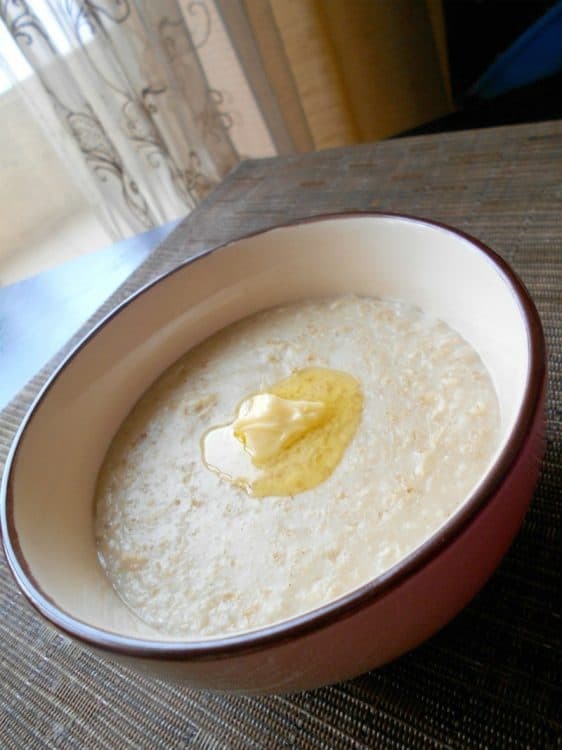 When the oats have cooked, reduce the heat and continue cooking while stirring regularly. Add about a teaspoon of butter, salt, and pepper to taste. You will see the mixture thicken. Stop when it is slightly thicker than your regular breakfast porridge. Top with a knob of butter, and serve immediately. Thank you for featuring my recipe on your lovely blog!